Puzzles are a puzzling thing. It is curious to wonder why someone would buy a box filled with many, many small interlocking pieces that once assembled will look just like the picture on the box, only a larger version covered with little crinkly lines, almost like age wrinkles. 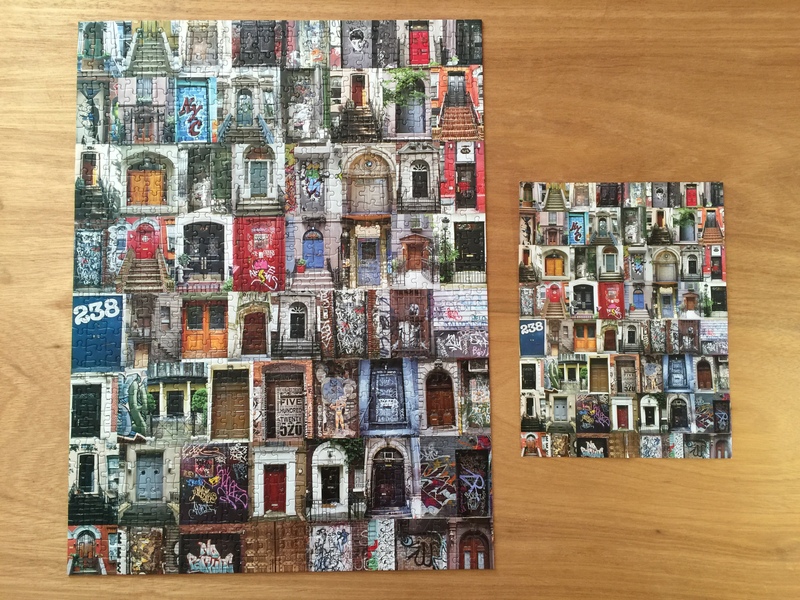 One would think that just a print of the puzzle photo would provide a superior quality image. But it’s not the image quality as much as it is the gamesmanship that continues to sell puzzles. Unlike Sudoku, which provides a numerical challenge or a crossword puzzle that presents a lexical trial, a picture puzzle represents a visual test. And puzzles with a huge number of pieces can also test our patience. 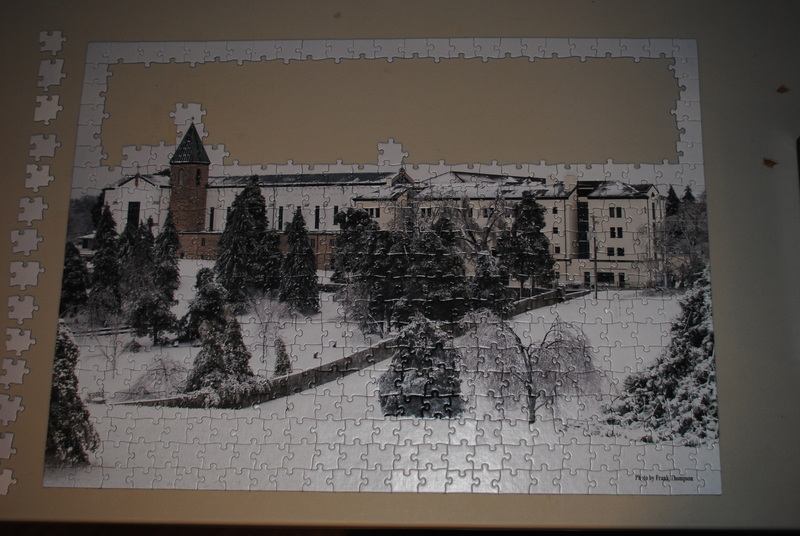 But with cold winter weather, a puzzle can offer hours of indoor fun when it is not conducive to venture outdoors. Over the years, my wife and I have assembled a number of puzzles, typically in the wintertime starting over the Christmas holiday when we have more free time. One was particularly challenging due to its lack of color. 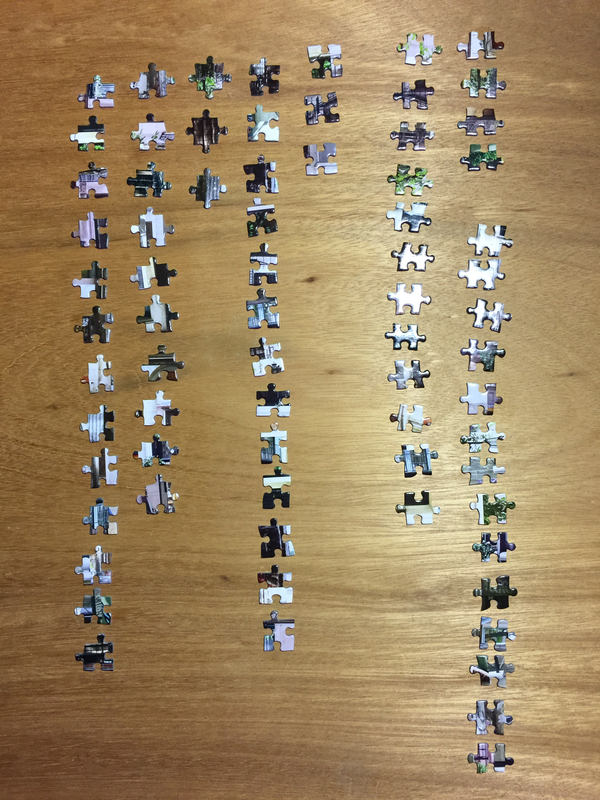 In order to finish the snow at the bottom of the puzzle and the sky at the top, I had to organize the pieces by common shape and trial-fit each one until I found a correct match. Another was particularly intriguing as it was a 4-D puzzle. 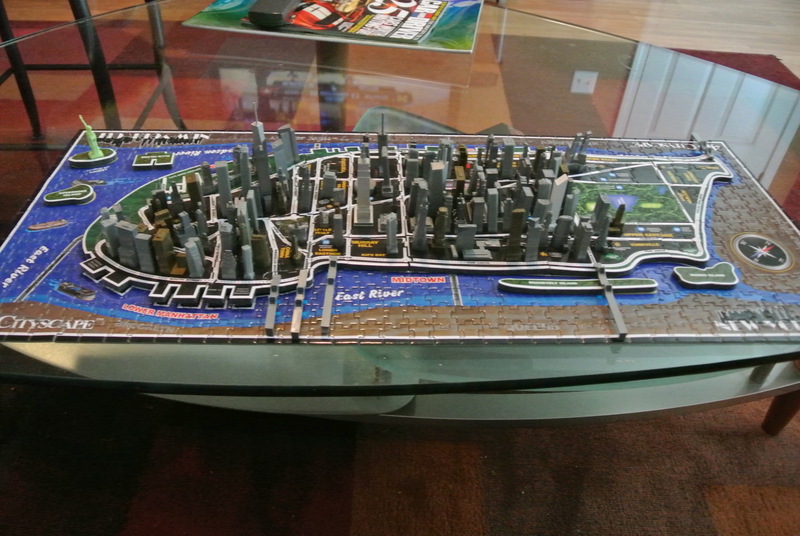 For this one, after assembling the Manhattan puzzle base, 3-dimensional skyscrapers were added in chronological order (time making the fourth dimension) starting with the earliest tall buildings and moving forward through even the removal of the Twin Towers. 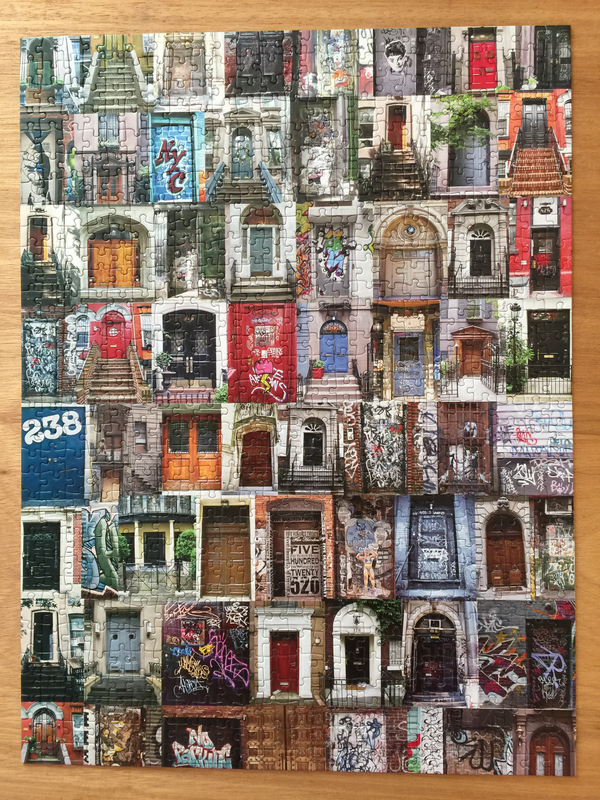 So it was over this last Christmas-New Years break that I started another puzzle, a mural of city doors, and a veritable “cakewalk” with only 750 pieces. This was one that I had actually gotten as a Christmas present several years ago and just never had opened. Obviously, the first step is to lay out all the pieces onto a table. As I did so, some of the pieces that were quite recognizable, I went ahead and assembled. Next step was to locate all of the sidepieces and begin to “frame” the image. As I was removing the pieces from the box, I had tried to put all of the sidepieces in one area of my table to make this process easier. Once I had done that, I realized my table was too small to provide a useable workspace and so I transferred all of the sidepieces to a wooden surface. Using the box top as my guide, I pieced these together but then noticed there were pieces that I couldn’t find on the box. 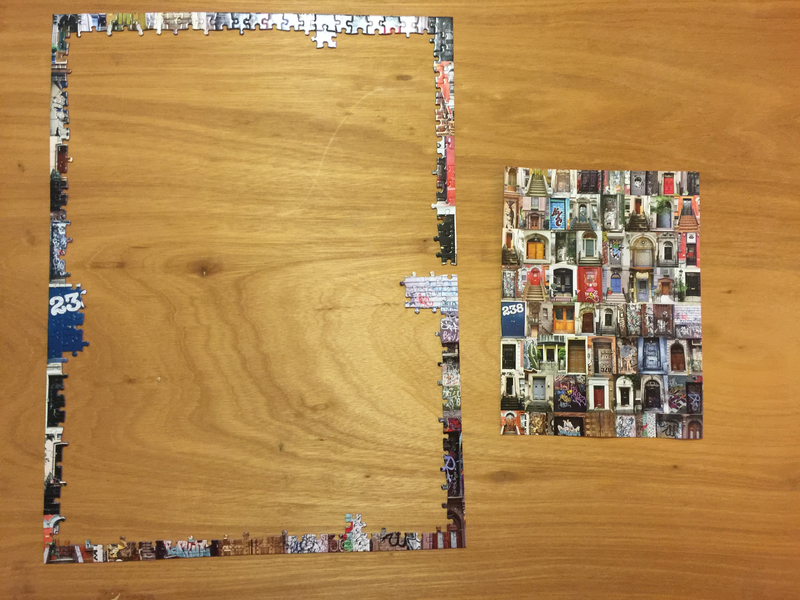 At this point, I realized there was a reason why the puzzle had included a “mini” poster as the entire puzzle image, being a rectangular-shaped 18” X 24” size, would not fit, even in a shrunken size, on the front of a perfectly square box. 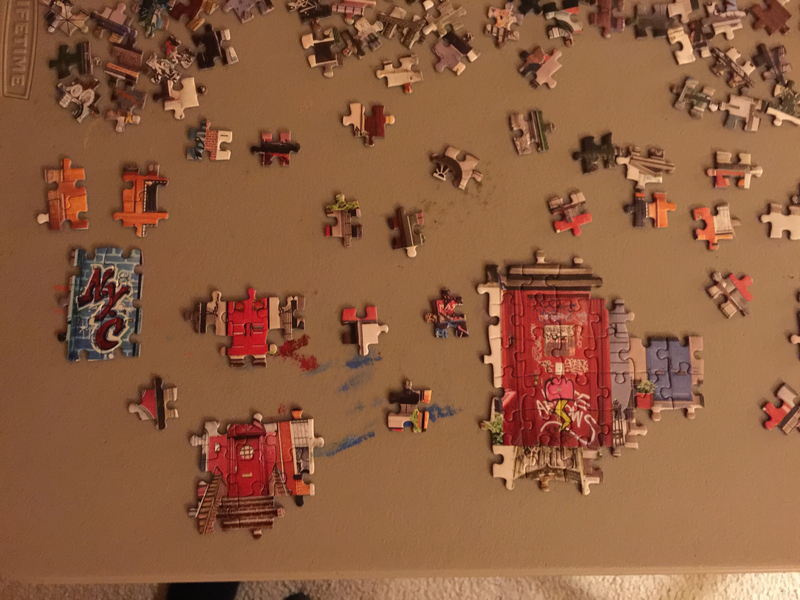 It was at this point that I also realized that the puzzle would not fit on the wooden surface I was using. 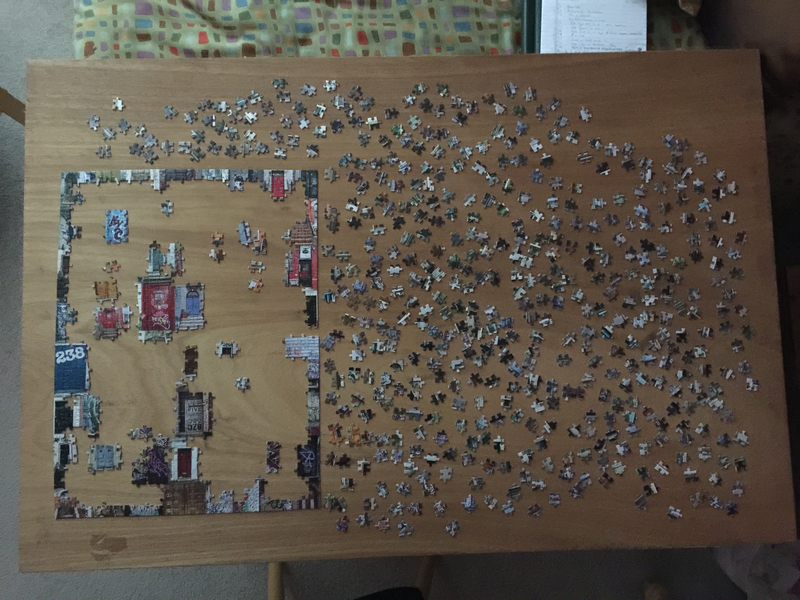 I looked around the house to find a larger surface that I could use that could remain undisturbed for the weeks that it would probably take to complete the puzzle. I came across my oldest son’s homemade drafting table from college that was actually made from a cutoff door. It fit nicely on top of the grey table I had been using and what better surface to assemble a door puzzle on than an actual door? 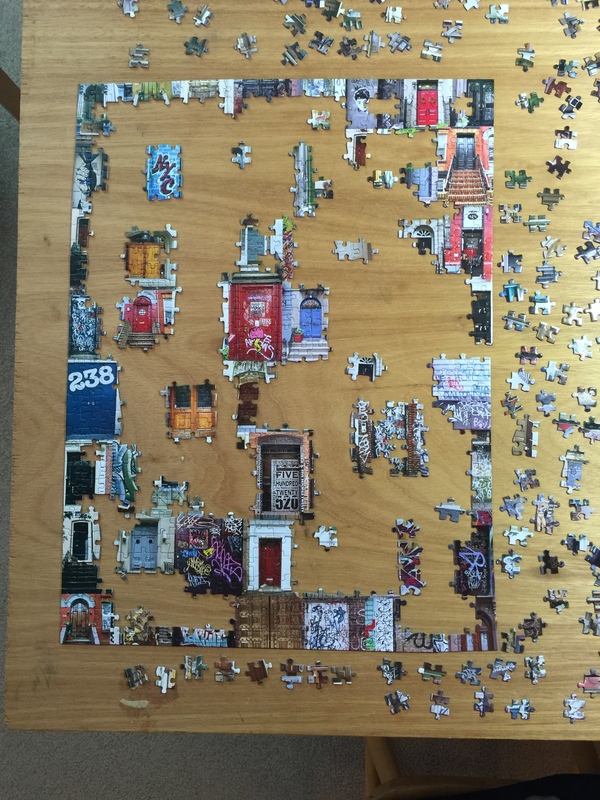 With sufficient space now available, I could layout the four sides of the puzzle. But quickly I realized that I was missing a number of sidepieces. Thinking I had already separated all the sidepieces, I went back through all the pieces and found 8 more. But I was still short. I then recalled a quality control test of an inspector’s attention to detail where the challenge is to find 15 red balls mixed in with 985 blue balls. It usually takes at least three complete run-throughs before all of the red balls can be isolated. It is amazing what you miss even when you know something should be there. I went through all the pieces four more times finding first 3, then 2, then 2 more, then finally none. But after all of this, I was still missing one sidepiece. I had a dreadful moment of angst that probably everyone who has ever put a puzzle together has had—maybe a piece had been left out of the box. 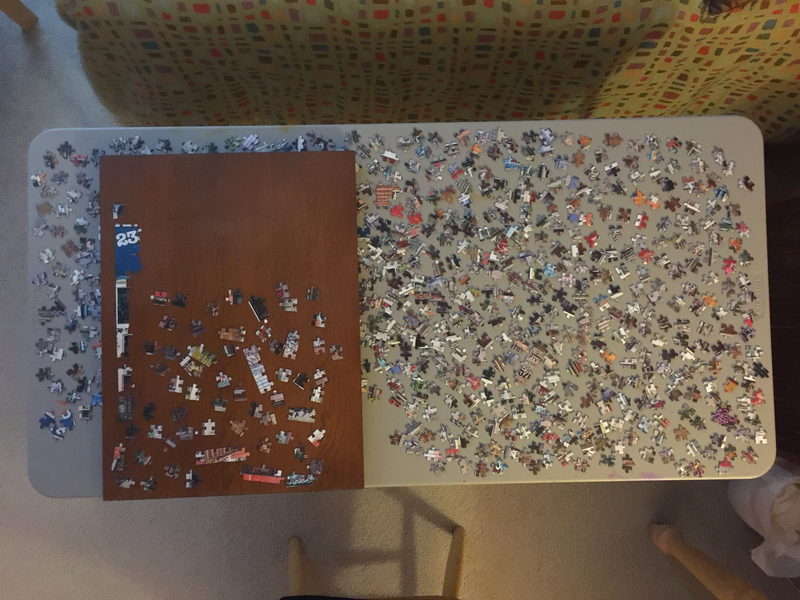 Out of 750 pieces of which 108 are sidepieces, what are the odds that a sidepiece would be the one missing? 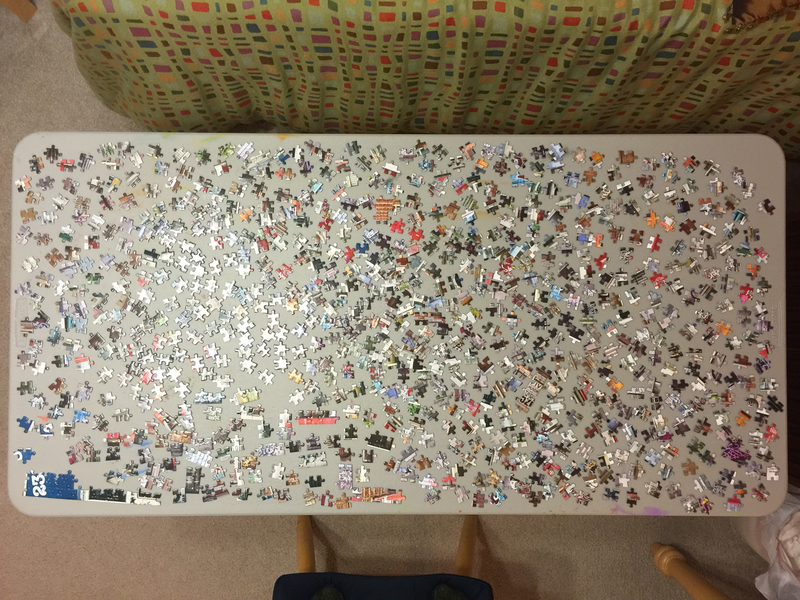 But rather than counting to see if I really had 750 pieces, I forged ahead. While the winter-scene puzzle I had done before was almost monochromatically white, this puzzle had a multitude of colors. I began searching for a few common colors and discovered that many doors were no more than four pieces. I first pulled all of the red color pieces together and was able to assemble three different doors. I continued this approach looking for common colors to try to match together. 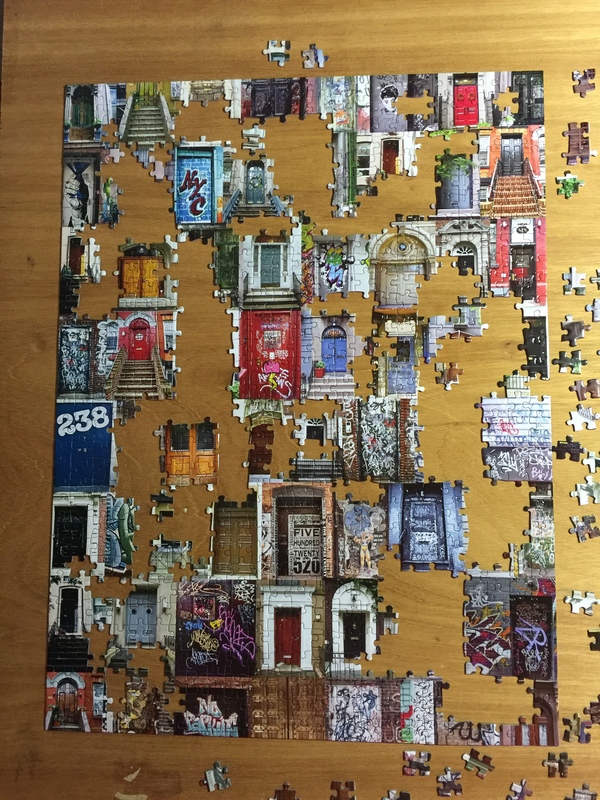 I soon found that some of the pieces I was searching for were actually sidepieces so I decided to begin to put the doors in the puzzle where I thought they should go. I did this and soon had a number of doors in place. But then I still had a multitude of pieces left to fit and I was running out of unusual colored ones that were easy to spot in the sea of pieces. But I trudged on making good progress. On more than one occasion, I tried to fit a piece that based on color, obviously went to a certain door only to find that the piece did not fit. 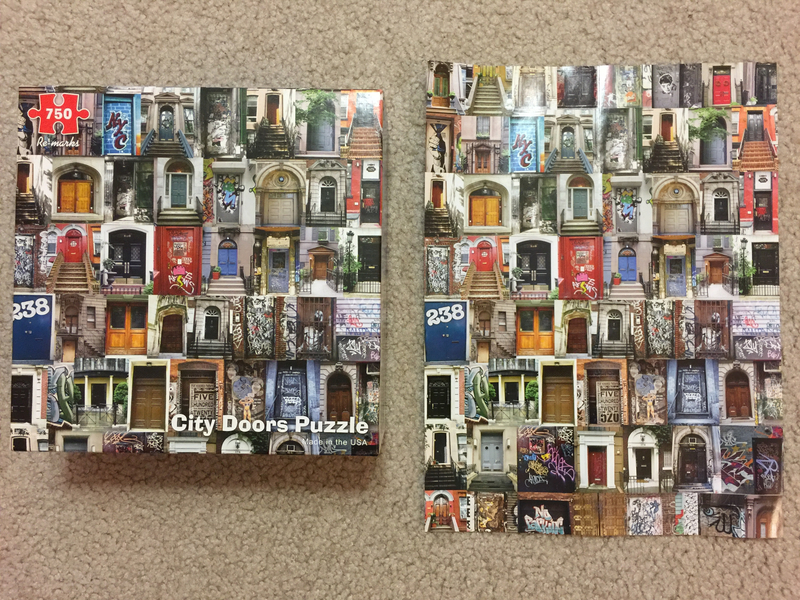 Looking more closely at the mini poster, I realized that three of the doors were actually duplicated on the puzzle. Whether to make it more challenging, or due to a shortage of door photos, I will never know? But it did make it more frustrating until I realized the replication of the three doors. 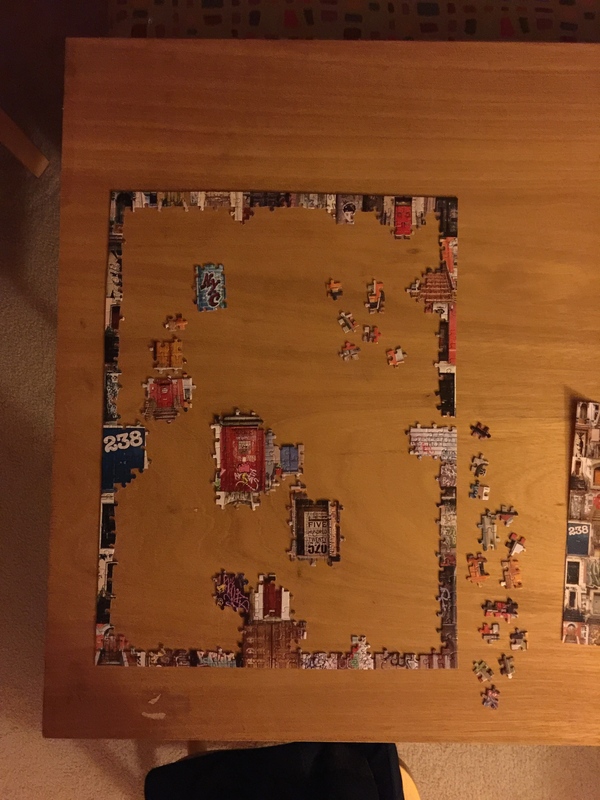 One night as I was working on the puzzle, I experienced probably one of the reasons puzzles are so popular—they are addictive. As you successfully place a piece in the puzzle and hear that satisfying snap as the piece goes into its singular location, you want to find one more, and then one more until before you know it, hours have gone by. And then Eureka! I found the last sidepiece; it wasn’t left out of the box after all. I don’t know how many times I might have picked it up, moved it, or glanced at it but all of a sudden, with less than 100 pieces left to place, it was clearly visible (guess I wouldn’t make a very good quality control inspector). This motivated me to continue and before long, I was left with about 70 pieces that didn’t have unique colors to make them easy to place. So I decided to employ that same technique that was critical to finishing the winter scene and organized the pieces by shape. With this aid, in short order I finished the puzzle. Turns out it took me less than a week to finish it. And in spite of not working on a puzzle for a couple of years, it motivated me to want to do another one. But much like books you never return to after you have read them, once you put together a puzzle, you don’t typically put it together a second time. So I have already ordered myself another puzzle—a 1000-piece version—I guess you could say as a Christmas present to myself. 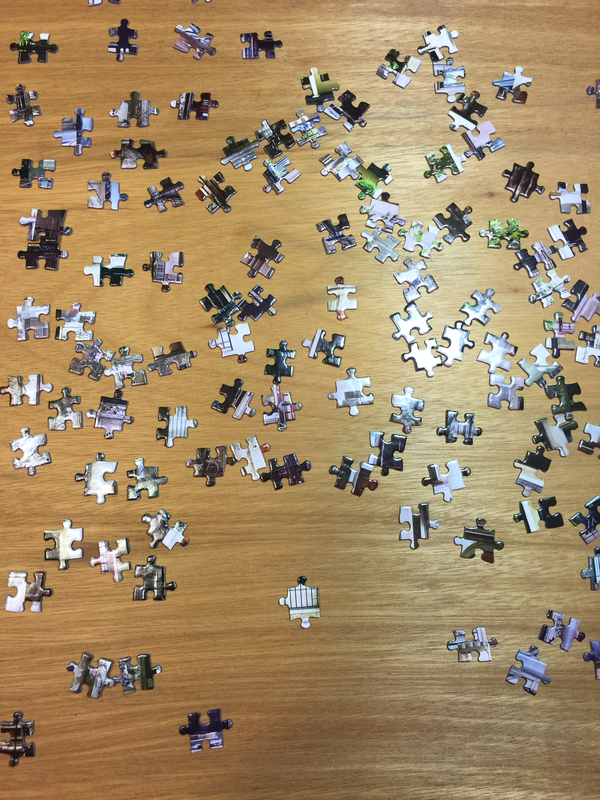 Until it arrives, I will leave my newly completed one on the table to admire my workmanship until the next puzzling challenge tests my visual acumen. 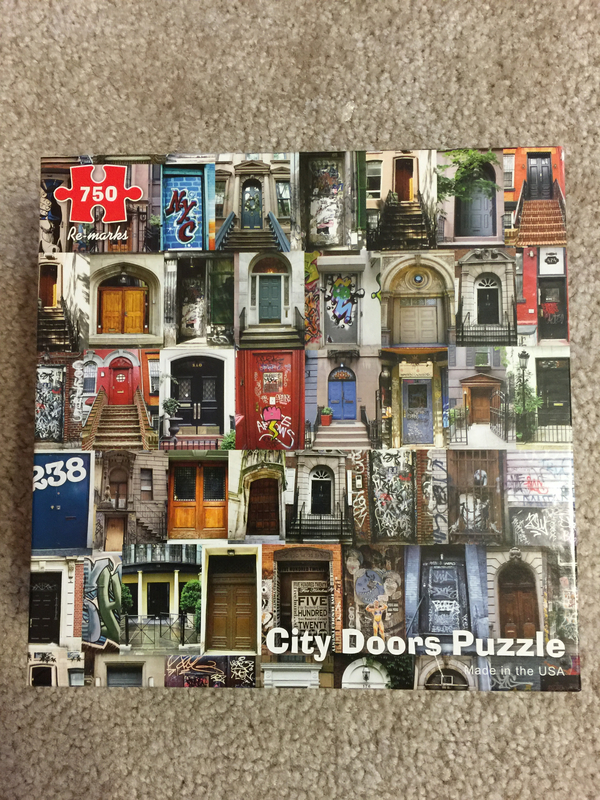 And maybe if you find the three duplicated doors on this puzzle, it will motivate you to assemble your own puzzle! Next Next post: Building Books – A Surprise! I definitely got hooked. Look for another post in the coming weeks.